Huckabee wins West Virginia. Huckmentum! More of a concern is a very, very bad ballot in California. 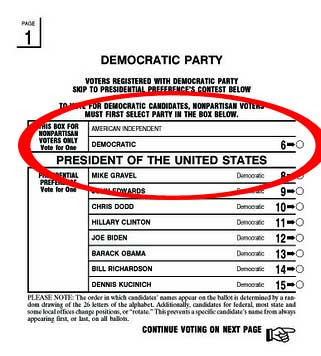 You HAVE to check Democrat at the top or the ballot is invalid. The Obama campaign is trying to get the word out. If you are voting in California, or know someone who is, make sure that box is checked. UPDATE: Long lines reported in Georgia, due to stupid assed voter id laws.